The days of working the same 9-to-5 job for 40 years are a fading memory. Work today may involve multiple part-time jobs, working from home, obtaining work through a mobile device, and changing jobs frequently. The so-called “changing nature of work” is already here, and at the U.S. Bureau of Labor Statistics we are trying to keep up with this new world. One of our primary sources of information on Americans’ labor market activity is the Current Population Survey (CPS), a monthly survey of households that provides a real-time snapshot of the share of the population who are employed and unemployed. These data are complemented by other BLS programs that focus on labor turnover, how Americans spend their time, details about local labor markets, and other topics. But how well do these programs track nontraditional forms of employment, including short-term assignments, platform work, temporary help, and jobs so new and different we haven’t even named them yet? BLS has been working on these issues for many years. Let’s consider a few timely questions and see how BLS has responded. Not all jobs are permanent. What do we know about jobs that are not expected to last? Throughout its history, BLS has been exploring perceived changes in the nature of work. For example, an article in the October 1996 Monthly Labor Review described “…reports of corporate downsizing, production streamlining, and increasing use of temporary workers…” as raising questions about “…employers’ commitment to long term, stable employment relationships.” This article, and many others in the same issue, went on to introduce the first “Contingent Worker Supplement” (CWS) to the CPS. Supplements such as this are additional questions on specific topics generally asked once (as opposed to every month) of CPS households. The CWS asks about jobs that are not expected to last, as well as alternative work arrangements, such as working as an independent contractor or through a temporary help agency. While not an ongoing BLS program, we received funding to conduct the supplement in 1995, 1997, 1999, 2001, 2005, and 2017. This allows us to track contingent work over time. In May 2017, there were 5.9 million contingent workers – those who did not expect their job to last. This represented 3.8 percent of the total employed. Twelve years earlier, a slightly higher percentage, 4.1 percent, did not expect their job to last. How many people are in different types of jobs, such as independent contractors? The most prevalent of these arrangements was independent contractors. 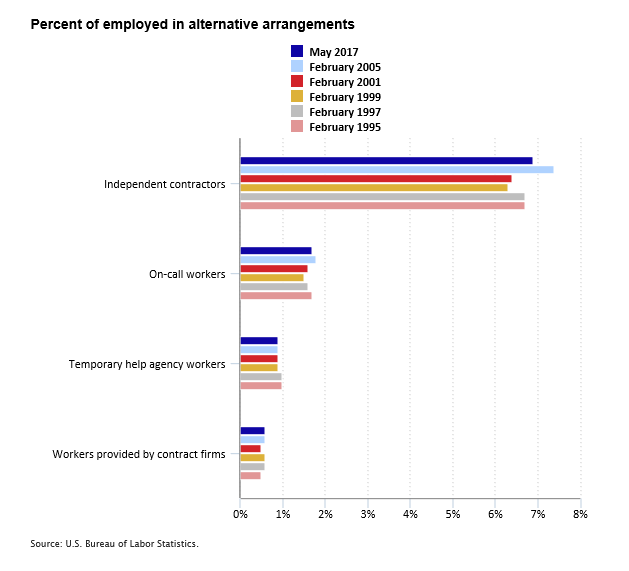 The 10.6 million independent contractors identified in May 2017 represented 6.9 percent of the total employed. Does BLS have a measure of the “gig” economy? A plumber or electrician may be on the payroll of a contracting company on the weekdays and obtain individual jobs through an app on the weekend. Gig worker? A substitute teacher in one school district may obtain assignments and pay through traditional means, while the neighboring district assigns and pays workers through an app. Is one a gig worker? Confused? So am I. To repeat, BLS does not have a definition of gig. Definitions developed by others may overlap with contingent workers and some of those in alternative employment arrangements in the CWS. Rather than try to develop such a definition, BLS chose to focus new questions narrowly, as you will see in the next section. What about work obtained through an app? While BLS conducted some testing of the questions on electronically mediated employment and vetted them with a variety of stakeholders, the results made it clear that people had difficulty understanding the questions. This effort resulted in many false-positive answers, such as a surgeon who said all of his work was obtained through an app. BLS used companion information, where available, to recode responses. To be completely transparent, BLS published both the original and recoded data, but we encourage data users to focus on the recoded information. 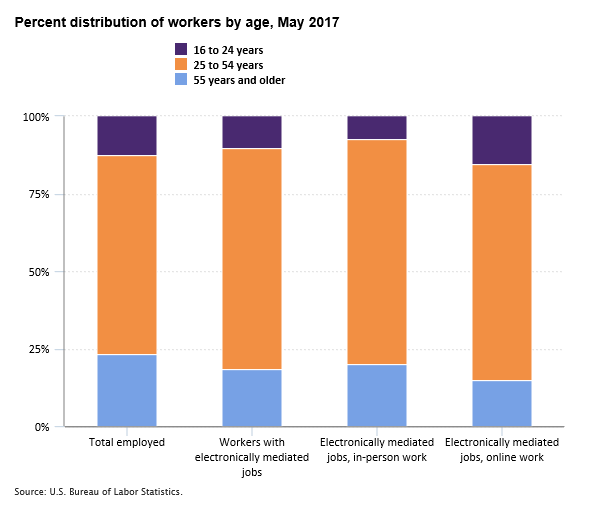 These results indicate that 1 percent of the employed in May 2017 – about 1.6 million people – held electronically mediated jobs. A slightly higher number of workers (990,000) held in-person jobs than online-only jobs (701,000). Note that some workers indicated they had both types of jobs. Compared with workers overall, electronically mediated workers were more likely to be ages 25 to 54 and less likely to be age 55 and older. Maybe these “app” jobs are a second job. Do we know how many people hold more than one job? We get information from the CPS each month on the number of workers who hold more than one job. In 2018, there were 7.8 million multiple jobholders – about 5.0 percent of total employment in 2018. That’s around the same share of employment it has been since 2010, but it was below the rates recorded during the mid-1990s, which were above 6.0 percent. With all these new types of work, is the BLS monthly employment information missing anyone? As noted, the CPS is an authoritative source of labor market information and has provided consistent data for over three-quarters of a century. But BLS is always looking to improve its measures, and there are other data sources that can supplement the CPS. For example, the American Time Use Survey obtains information about an individual’s activities during a 24-hour period. Among the categories that may be identified are “income-generating activities,” such as making pottery for pay, playing in a band for pay, and mowing lawns for pay. Recently, BLS looked at people who were not counted as “employed” but who participate in income-generating activities. The research suggested that between 657,000 and 4.6 million people participated in income-generating activities but were not otherwise counted as employed in the survey. Given that total employment is around 155 million Americans, this undercount ranges from 0.4 to 3.0 percent of the total. The study also examined the extent that employed people who did informal work in addition to a regular job might not be correctly classified as multiple jobholders. The research found that reclassifying workers misclassified as single jobholders would increase the number of multiple jobholders somewhere between 3.0 percent and 20.7 percent. What more is BLS doing to improve labor market measures? So, yes, BLS is doing a lot to improve our labor market measures, and the work continues. We know there is likely a small number of people who are not counted as employed yet perform income-generating activities. We know that definitions and concepts may need to be updated from time to time. We know that some terms, like “gig,” are not well defined and mean different things to different people. And we know it is not easy to define or identify electronically mediated employment. Given all this, we continue to move forward. BLS has contracted with the Committee on National Statistics, part of the National Academies of Sciences, Engineering, and Medicine, to convene an expert panel to address these issues and provide recommendations to BLS. This work began in late 2018 with a report due in early 2020. BLS will review the recommendations and, resources permitting, develop plans to test any new concepts or questions. There’s been interest in emerging types of work for many years. It’s also a moving target, as the “changing nature of work” keeps changing. BLS has provided gold-standard data on America’s labor force for many years and will continue to research and refine and improve. What Do We Know about Mega Metros? Not only does BLS produce nationwide economic indicators, but we also have a treasure trove of data for metropolitan areas across the country. According to the U.S. Census Bureau, 62.9 percent of our country’s 325.7 million people live in incorporated places. To celebrate our metro areas, we looked at the data for our six largest ones. We started with five but expanded to six, and you’ll soon see why. New York City: Since the first census in 1790, New York has been our most populous city. Its population of 8.6 million makes it more than twice as large as the next largest city, Los Angeles. Los Angeles City: With a population of about 4 million, Los Angeles first showed up on the top-five list with the 1930 Census. Chicago City: Even with little population growth over the last several years, Chicago remains the third-largest city, with a population of 2.7 million. Chicago first showed up on the top-five city list in 1870. Houston City: And now we get to the Sun Belt, which seems to expand every year. Houston, with a population of 2.3 million, was a top-five city starting in 1980. Phoenix City: In 2016, Phoenix beat out Philadelphia for the number five spot on the most populous city list. In July 2017, its population was 1.6 million. Philadelphia City: Since Philadelphia was the second most populous city in 1790 and remained within the top five until Phoenix nudged it out in 2016, we kept it on our list. Philadelphia’s population is almost 1.6 million. What makes a metro area great? That’s easy—its people! So what’s happening with the people in each metro area? Are they working? Where do they work? What type of work? What are their earnings? How do they spend their money? We won’t use these long titles, but we will compare the areas listed above. In November 2018, the national unemployment rate was 3.5 percent. Los Angeles had the highest rate (4.2 percent) among these six areas. Phoenix (3.9 percent), Houston (3.8 percent), Chicago (3.8 percent), Philadelphia (3.6 percent) and New York (3.3 percent) round out our list. New York had the largest over-the-year decrease in their unemployment rate among these six areas from November 2017 to November 2018 (-0.9 percentage point). Los Angeles was the only one of the six metro areas that had an over-the-year increase (+0.2 percentage point) in the unemployment rate. How about the number of jobs? Has that been going up? As we walk around our metro areas, we will see more folks going to work than a year ago. Nonfarm payroll employment increased for all of these areas from November 2017 to November 2018. Two showed growth rates above the national average—4.2 percent in Phoenix and 3.7 percent in Houston. The other four areas showed growth rates of 1.5 percent or lower. The national growth rate was 1.6 percent. Where are people employed? What industries? What industries employ the most workers? Trade, transportation, and utilities is the biggest industry, with 28.5 million workers nationwide. Education and health services (24.1 million workers) comes in second. As we walk around each of these metro areas, what industries will we see employing our workers? Basically the same as the nation! In four of the six areas (all but New York and Philadelphia), trade, transportation, and utilities is the biggest industry. For both New York and Philadelphia, the biggest industry is education and health services. What kind of occupations do people have? What occupations do these folks have? This might sound like what we just covered, but occupation and industry are different. For example, I’m an economist (occupation) who works in government (public administration industry), but I could be an economist who works in a bank (financial activities industry). I must admit I was surprised that, for all of our metro areas and the nation, these are the three largest occupational groups for our workers: office and administrative support occupations, sales and related occupations, and food preparation and serving related occupations. So as you walk around these metro areas, you will see people hurrying to work on a computer, sell an item, or cook a meal! What about earnings? Do they vary much by metro area? Nationwide, average hourly earnings in November 2018 for all employees were $27.28. Phoenix had the lowest average hourly earnings among these six areas, at $27.22. The highest average hourly earnings were in New York, $32.83. That’s a difference of $5.61 per hour between the highest and lowest averages among these six metro areas. Where do folks spend their money? Because of small sample sizes for metro areas, we’ll use an average of 2016–17 data on consumer spending for metro areas and the United States. Consumers in the three largest areas—New York, Los Angeles, and Chicago—all allocate a larger share of their total spending to housing than the national average. The U.S. housing average is 33 percent, while New Yorkers spend about 39 percent on housing. The percentage of households that own their homes also varies in our areas: Philadelphia has the highest homeownership percentage (70 percent), while New York has the lowest (49 percent). But New York residents spend less on transportation, 12 percent, compared to Houston residents, who spend 18 percent. Want more metro area data? You might not know about our Economic Summaries, which gather data from many programs. We have information for hundreds of metro areas in all 50 states, plus a couple of territories. We also have geographic definitions for each subject. We update the summaries each month to keep them fresh. 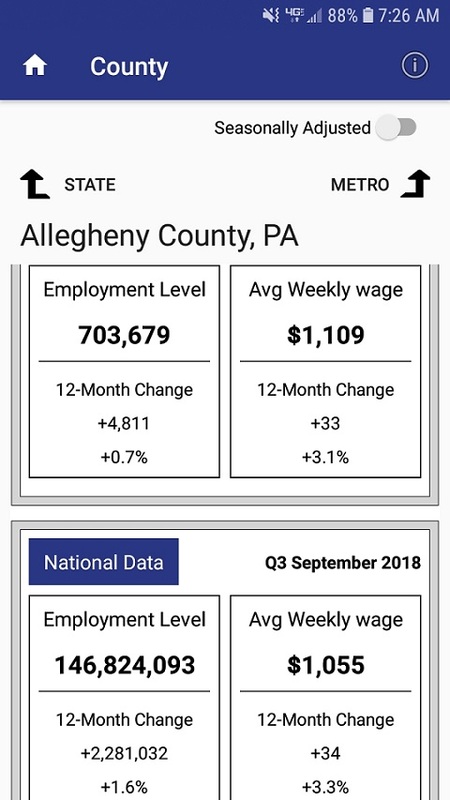 You can use these Economic Summaries to see how your area is doing. If you have questions about this information, feel free to contact one of our BLS Regional Information Offices. We provide these gold-standard data to help you make smart decisions, such as, do you want to stay in your metro area? Or does another catch your eye?! *A note to our readers that the above data are not seasonally adjusted and some may be subject to revision. Area definitions may differ by subject. For more area summaries and geographic definitions, please see our Economic Summaries. 100 years after World War I: What’s the Labor Market Status of Our Veterans in 2018? As we commemorate the 100th anniversary of the end of World War I — at the 11th hour on the 11th day of the 11th month of 1918 — we also want to honor our current veterans. In October 2018, 19.1 million men and women were veterans, accounting for about 8 percent of the civilian noninstitutional population age 18 and over. After reaching 9.9 percent in January 2011, the unemployment rate for veterans was 2.9 percent in October 2018. The peak unemployment rate for nonveterans was 10.4 percent in January 2010; their rate was 3.5 percent in October 2018. The unemployment rate for Gulf War-era II veterans—those who served on active duty at any time since September 2001—reached 15.2 percent in January 2011. In October 2018, the unemployment rate for these veterans was 3.1 percent. There were 269,000 unemployed veterans in the United States in October 2018. Eighteen percent of them were ages 18 to 34, 39 percent were ages 35 to 54, and 43 percent were 55 years and over. In the third quarter of 2018, more veterans worked in government than any other industry; 21 percent of all employed veterans worked in federal, state, or local government. By comparison, 13 percent of employed nonveterans worked in government. After government, veterans were most likely to work in manufacturing and in professional and businesses services (about 11 percent each). Looking for more information on veterans? Check out our page devoted to veterans. Now, let’s take a look at some data that may help veterans who are looking for work or considering a career change. 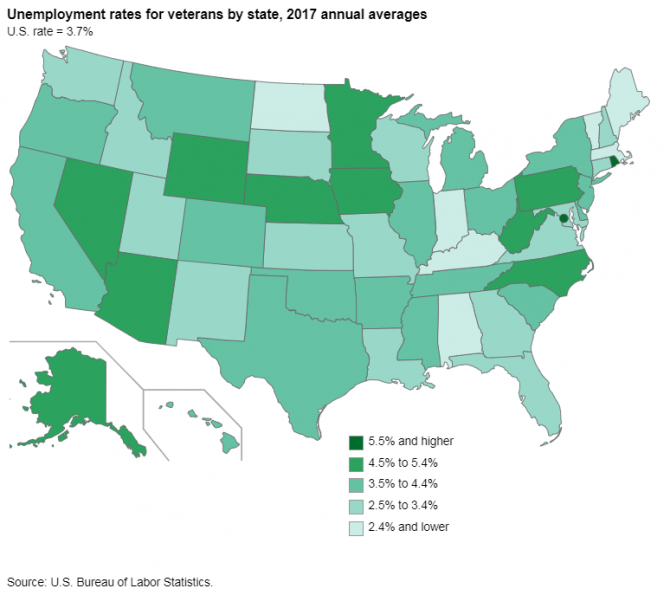 In 2017, the unemployment rate for veterans varied across the country, ranging from 1.7 percent in Maine and Vermont to 7.3 percent in Rhode Island. Editor’s note: Data for this map are available in the table below. 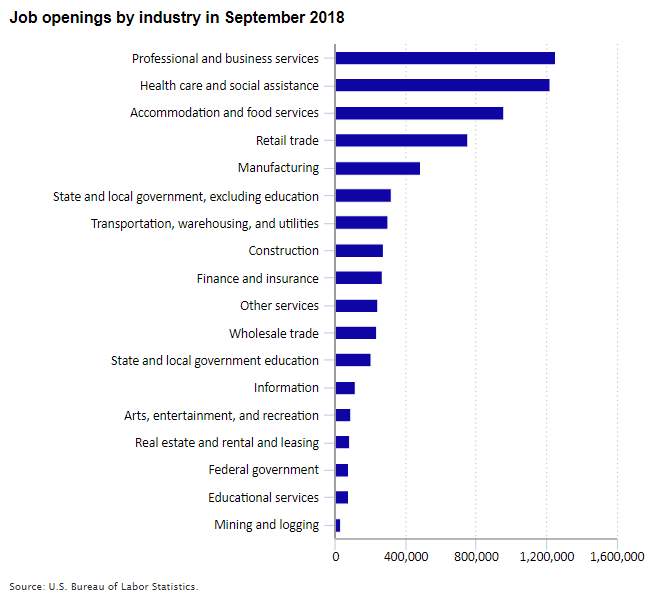 There were 7.0 million job openings in September 2018. Here’s how they break down by industry. Fourteen of the thirty fastest growing occupations are in healthcare fields. The Occupational Outlook Handbook can help you find career information on duties, education and training, pay, and outlook for hundreds of occupations. Career Outlook provides articles, interviews, and data of interest, such as the 2017 article “A closer look at veterans in the labor force” and this 2018 comparison of military and civilian work. More education may help you to keep a job and increase your earnings. See Unemployment rates and earnings by educational attainment. Thank you, veterans, for your service. As with our armed forces of the past, your service is the foundation of this great nation. Want more information? Check out our website at www.bls.gov 24/7 or give our information office a call at (202) 691-5200. We also have regional information offices available to help you. BLS has the data YOU need to make wise decisions. Note: Veterans are men and women who served on active duty in the U.S. Armed Forces and were not on active duty at the time of the survey.